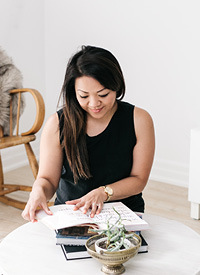 New Project - Dressing Room — Love On Sunday Love On Sunday | Interior Styling in Toronto and the GTA. I've posted about having a dream closet but I never thought I'd have the opportunity to design one! It turns out one of my besties Anh, is looking to transform her extra bedroom into a dressing room. We've been using the term 'closet' but in all honesty I think dressing room is a more appropriate term since it will be huge! I'm talking space for a shoe wall, a sitting area and a computer. AH-MAZING. How fun is it to decorate a space when you already love their taste? The second reason why I'm super stoked is because she's always been one of my biggest fans and supporters (I'm talking girlfriends since highschool...in fact you may notice she's a frequent commenter on this blog. Thanks Anh! xoxo). I love how they framed bags to add colour and interest. Also that display case is gorgeous. The extra room has been cleared and we're now starting to search for some key pieces for the room. Make sure to follow along to see the progress! You can also follow me on Instagram (amy_loveonsunday) and my Facebook page (Love On Sunday) for more updates. Happy Hump Day All!